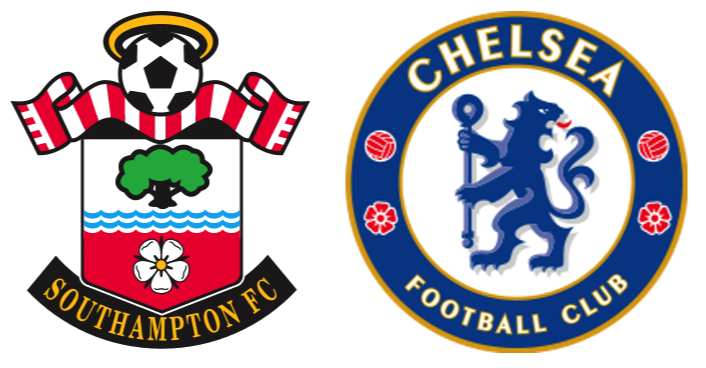 Saints organisation gave way over the course of the game to the apparent higher skilled players for Chelsea. The Blues lacked the organisation but brought the hustle and the grit. Sadly, Saints missed some gilded edge opportunities early on that could've made the game less in reach for the pending Chelsea come back, but overall defensive miscues which have been non-existent in the clean-sheet streak perked their ugly head and gave way to two gifted goals. Saints missed the first clear chance of the game in the 9th minute when Davis's cross was punched out by Cortois, only to be lobbed back in and chased down by van Dijk. Virgil turned and delivers a perfect ball to Long, who climbs over the defender for a clean chance but puts it over the bar. At 9 minutes, with the way we were playing cohesively and confidently, that would've served a boost. Saints continued to press and exhibit no fear against last season's Champions. Another close chance came in the 22nd minute when another cleared corner this time from Bertrand, came back in and off the head of van Dijk and led Austin wide for a clean cross. It hung and was pushed wide by Cahill to safety. But it did feel like Saints were going to be due a goal sooner rather than later. Just on the half hour, Chelsea had a decent chance, when Oscar aims for the bottom right corner of the goal, but Forster makes a good save. The action moves up to the other end of the pitch and Saints go on the attack. Davis plays into Charlie Austin, who is facing away from goal. The striker is making his first start for Saints today, turns and hits just wide of the right post. After 35 minutes a milestone is reached, Fraser Forster has now surpassed Paul Jones' 666-minute unbeaten run from 2000/01. The crowd make a bit of noise to congratulate him and he puts his hand in the air in acknowledgment. Then, out of the blue on 42 minutes, Saints have the lead. An opportunist goal from Shane Long. The ball came back to Rahman in the Chelsea defence. He looks square to play to Ivanovic to his right. As he heads across, Long nips in. His first touch pushes the ball deep into the Chelsea box. Courtois isn't quick enough and Long pushes the ball round the keeper into the bottom left of the goal. He wheels away in celebration. The half ended shortly after, with the ground still buzzing about Long's 10th goal of the season. Chelsea were well on top with possession, but it is Saints that are in front with the one stat that counts, goals scored. The second half follows the pattern of the first half, with Chelsea having the lion's share of the possession, without ever really fashioning an opening, but you felt that it was probably coming. After a while Chelsea begin to get frustrated and Costa is involved in several scuffles, picking up a booking for a wrestling match with van Dijk. With 20 minutes to go, you can't help but admire both Virgil van Dijk and Oriol Romeu, who were having superb games and were stemming the tide of Chelsea attacks. There was a decent shout for a penalty when Charlie Austin is bundles over in the area by Cahill. The referee, Martin Atkinson was not unmoved. Then, on 75 minutes Chelsea scored. Fabregas curled a shot across the face of goal. Forster tried to flick it away with his left leg, but it still got past him into the bottom right of the net. So, shortly after surpassing Paul Jones record, the big man conceded at last. The new record now stands at 708 minutes. Who is to say that Forster will not break that again. You sensed that Saints were tiring and Chelsea stepped up the pressure. It was a question of holding onto the point, rather than going for the win. There was an air of inevitability when, in the 88th minute Chelsea's second goal arrived from a corner. Willian took the kick and Ivanovic meets it centrally in the box and shrugs off the attentions of Virgil van Dijk, hitting the ball into the bottom left of Fraser Forster's goal. A killer goal indeed. There was no time to react and there were a lot of serious looking faces on the Saints bench, no doubt wondering where it had all gone wrong. Saints substitutions just didn't make sense. I am starting to see how Koeman has backed himself into a corner a bit, as he's now found a way to be successful with Long up front that demands he's paired with Mané and then when Pellè is in we really need Tadić delivering crosses. It was readily apparent that Pellè still doesn't fit the current system and certainly will struggle more with the linkup/give n' go mentality of two strikers up front v. being the sole target man. That being said, I have to give credit to Chelsea, even while being outplayed in the first half their individual class on the ball was readily apparent. What they lacked in organisation and structure was more than compensated for by determination and individual skill (and defensive errors never hurt their cause). I'm torn between seeing this as a wakeup call, or a return to Saints sheepishness that readily rears it's head anytime talk of positive expectations really take weight. This club still plays best when they're not pressing themselves. Lacking the world class point stealer the likes of Costa, Ozil, Aguero, to name a few, Saints are forced to always play cohesively and create chances. There's seldom going to be an unforeseen saviour who makes an individual effort to steal the points. This was evident here as Chelsea, though less organised, always seemed more confident with the ball at their feet. Saints press died down with tiredness and as we saw earlier in the season when they take their foot off the gas or just run out of it, they give up chances to the opposing side. Unfortunately those chances went hand in hand with out of form errors by the lately staunch back 3 but to be fair, we should know this was coming. Forster was going to let in a goal before the end of the season, the line in front of him was going to hang him out to dry. I hope this serves as more of a wakeup call with two very winnable matches to come (@cherries then back St. Mary's for Sunderland) in short succession. I do hope Ronald saw a renewed spark on the training ground and we see Saints return to their chipper and no-nonsense defending. Furthermore... the starting XI must include Tadić or James Ward Prowse. In my opinion leaving both of these guys on the bench is a crushing negative on our ability to create from free-kicks and corners, something that I would've thought Ronald was more focused on in this game, as I never like to presume open play dominance against a big club with 'better' athletes.